X-posted from my Creative Space. Sometimes I like to challenge myself and do something new. Think outside the box and step outside of my zone of familiarity, and my zone of comfort. Kind of like the saying, do something new or something that scares you everyday. Not necessarily just by creating this piece, but also by sharing more about myself at the end. 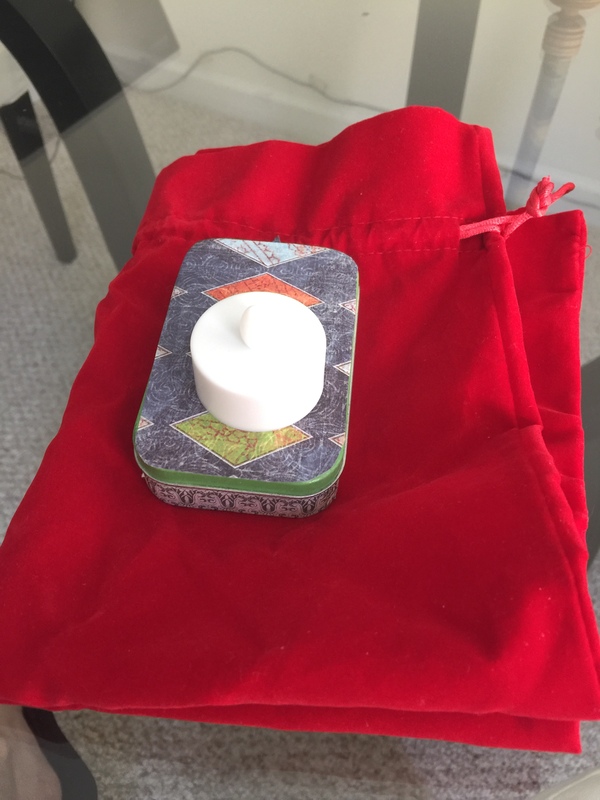 I looked through my stash of art supplies and I decided to craft this portable altar kit. It could also be described as a mini-shrine, and mine is made of upcycled, repurposed and recycled materials. You don’t have to spend a lot of money on something like this. Honestly most things I acquired for free, already had on hand, or made. I gave a few examples of what I gathered the products from to give you your own ideas. On how you can upcycle things into a meaningful craft. If you’re unfamiliar with what a shrine or altar is, here’s a brief description. While The dictionary talks about them being a receptacle for sacred relics, or a place considered sacred because of its relationship to a holy person or event, they can also be for other reasons. You could have one for political, humorous, satirical, one’s family, travel, nature, basically anything that is of interest of the artist creating the piece, or imbibed with intentions for the person it’s being designed for. The “box” was made from an old altoids [mints] tin I had lying around. The covering is a combination of papers from old kannada calendars, printer paper, cardstock, and scrapbook paper. The sacred objects are items that hold value and have meaning to me. Things I have picked up during my travels. -A red rock from a vortex in Sedona, Az. -Rudraksha seed/bead from a spiritual retreat. -Thread from a puja in India. 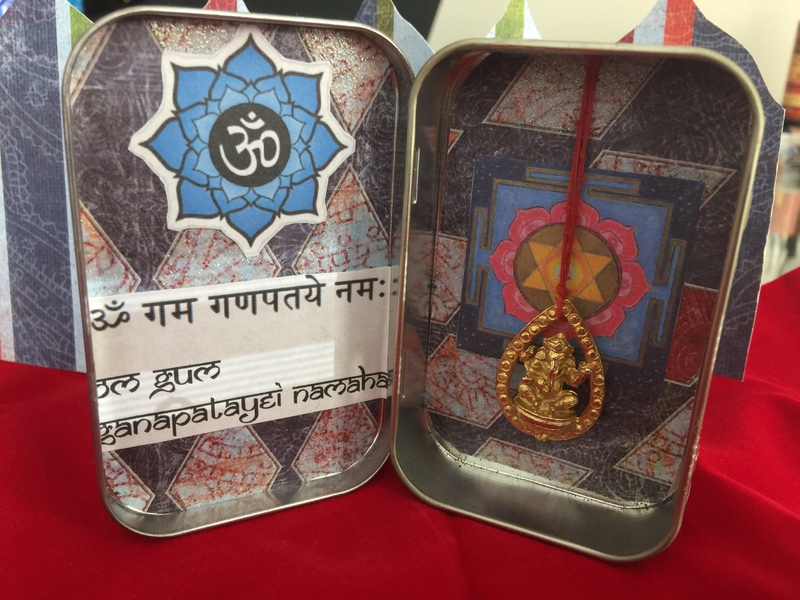 -Sacred symbols, quotes, yantra, shloka book, mantras etc… I made using scrap paper and my printer. I never feel like it’s 100% finished, because I add special items from my journeys, and because I keep adding items from a personal wish list of items I originally wanted to add to the little altar that I came up with as I was creating it. Portable altars come in handy for those who travel, someone living in a small space, someone going off to college, and I am sure there are other examples. Taking a deep breathing and just diving in. Since I don’t always talk about myself on here, as some of you may not know I celebrate an amalgamation of holidays and this craft honors the cultures that resonate with me. 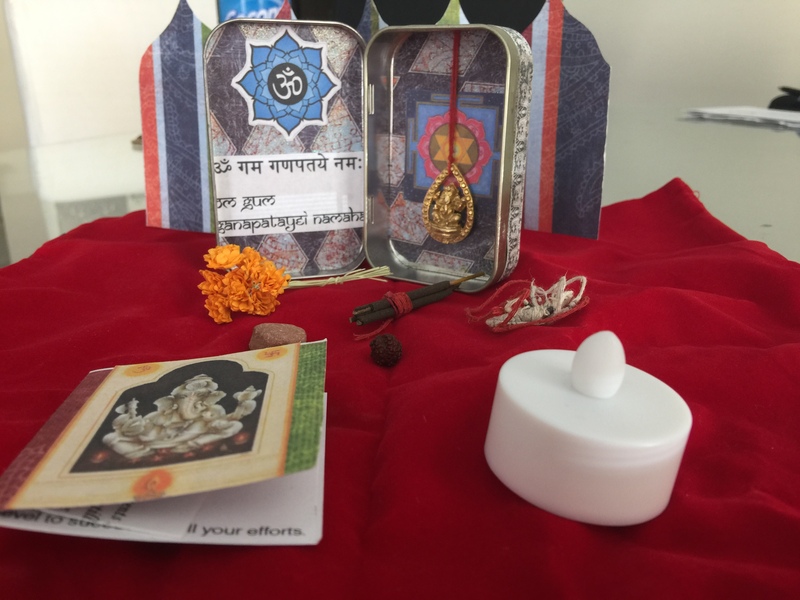 I honor Hindu culture and customs, as well as the standard American / Catholic Holidays that are common such as Christmas, Thanksgiving, Easter etc… The next Hindu holiday upcoming is Ganesha Chaturthi, and since I will likely be out of town this little altar will come in handy for me. I do not consider myself to be a religious person, but a person who is spiritual. I previously haven’t written many personal details on my blog due to the need in the professional world to have keep details of my personal life withheld. Keep my cards held close to my chest and keep myself out of the limelight. I am now at a new path in my life where I can share more, not be so closed off or guarded. After not having done this for so long I feel really vulnerable to open up. Sometimes it can be freeing to write to a world of strangers, to write to no one you know in particular, but today alas is just one of those days I just feel more susceptible to judgement. Anyway I hope you enjoy hearing about me and getting to know more about me from time to time. 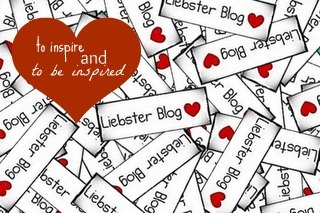 I also hope this post maybe taught you something new or inspired you to do something new today as well. In honor of yesterday being earth day. What better way to reduce, reuse, and recycle. 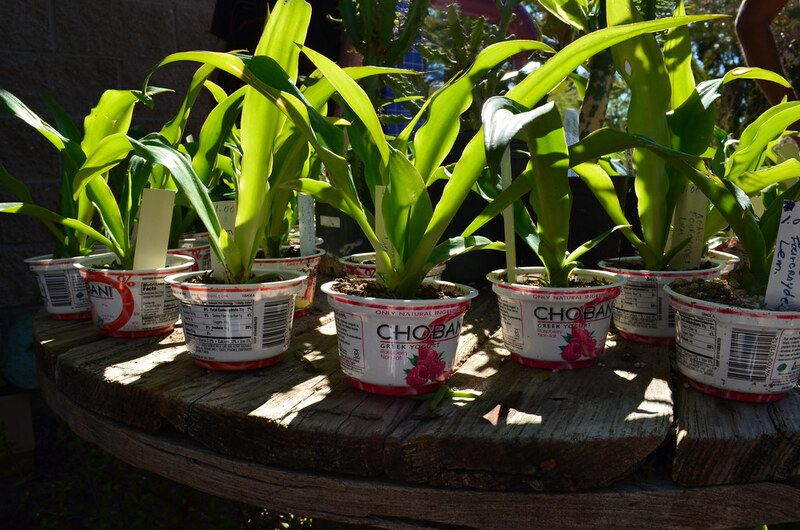 Using yogurt containers to make new plants to provide us oxygen so that we may live. I know many of us yogis care about our earth. One of the popular efforts we utilize to care for Mother Earth is recycling. On a recent grocery trip to a local favorite, Trader Joes, I remembered I wanted to pick up a toothbrush. I went down the household items aisle and discovered that their “Preserve” line of toothbrushes are not only made from recycled products, but are easily recyclable. The toothbrushes are made from recycled yogurt cups. When it’s time to swap your toothbrush out for a new one, all you have to do to recycle that old toothbrush is drop it back in the free USPS mailer that your tooth-brush originally came with. 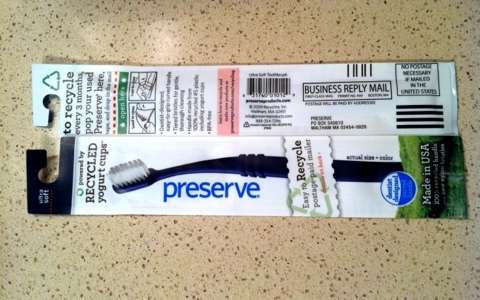 If you happen to lose the mailer, and are replacing with the same Trader Joes brand “Preserve”, you can use the envelope that your new replacement toothbrush came in.